Serge Lutens' first "anti-perfume", 2010's L’Eau Serge Lutens, was mildly controversial in the perfumed blogosphere. I didn't love it, but I didn't much mind either; as I said then, Mr. Lutens can do whatever he needs to do to keep himself interested — and/or to keep his brand afloat and attract new customers in new markets. Now we have the second in the L'Eau series, L’Eau Froide. 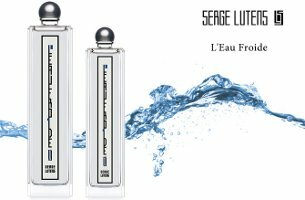 L'Eau Serge Lutens referenced clean shirts and cleanliness in general; L'Eau Froide, of course, is about cold water, and the brand's website mentions "some fresh air in the rusty old water pipes". That's marginally more appealing to me than the clean shirts, but only marginally. As it turns out, I like L'Eau Froide much better than L'Eau Serge Lutens, but if you want the ending now — saves time, right? — I'll add that while I enjoyed wearing it, it's not going on my buy list. L’Eau Froide opens on very cold lemony citrus, and the scent's mineral facet is evident right away: it smells like verbena and crushed frozen stone. It gradually turns mildly spicy, but in a cold rather than warm way, with emphasis on the mint and ginger (reportedly, the other notes include frankincense, aquatic accord, vetiver and four different types of musk). After that, it's a woody-musky incense, sheer and crisp early on, slightly warmer in the far dry down, but still reasonably summery. Smelled up close, L'Eau Froide is an enjoyable twist on a unisex summer fragrance, and it probably has enough heft to take it into spring or fall as well. It's clean, but it isn't as relentlessly clean as L'Eau Serge Lutens. Still, from a distance, the early stages teeter dangerously close to what I think of as "generic department store man smell, sportified", insofar as mint + ginger + chilly citrus are the hallmarks of the modern masculine sports flanker. Luckily, that phase doesn't last, and anyway L'Eau Froide is better done than most — if you know a man who has to wear a sports scent, perhaps L'Eau Froide would be a viable alternative? Personally, I'd prefer something a bit less clean, with a bit more oomph — Comme des Garçons Ouarzazate, although warmer and sweeter still, is my idea of a perfect summer incense, along with the classic Passage d'Enfer by L'Artisan.1 But L'Eau Froide is worth trying, even if L'Eau Serge Lutens left you absolutely cold (with sincere apologies for the bad pun). Serge Lutens L’Eau Froide was developed by perfumer Christopher Sheldrake. It is in the export line, and is available in 50 ($105) and 100 ($150) ml Eau de Parfum. The lasting power is good, although it is rather close to the skin after a couple hours. For buying information, see the listing for Serge Lutens under Perfume Houses. 1. The best for spring is of course Etro Shaal Nur, and fall is Tauer Incense Extrême or Sonoma Scent Studio Incense Pure. Winter is Donna Karan Black Cashmere or Amouage Jubilation XXV or Olivier Durbano Black Tourmaline (actually, there are too many great winter incense fragrances to decide which is best). Do feel free to add your own incense favorites in the comments! Oh, so glad I had something that took your mind off billing, even if only for a moment! It is an absolutely perfect summer day here, hate to even think about billing. I think this one qualifies as an incense scent…and it’s a big favorite – Frédéric Malle Angéliques sous la Pluie. Very well done review, thank you. We are not picky, so of course it qualifies! Thanks for the review, Robin. I got a sample of L’Eau Froide a few months ago and although it is rather nice, I did not like it enough to want it. My favourite incense fragrance is Tauer Incense Extrême. It is such a beautiful fragrance and it transports me back to times when I was a child, practicing caligraphy in an ancient Japanese temple. And I also love the traditional Japense incense fragrances from Kyukyodo. Now does Kyukyodo make personal fragrances, or you probably mean the incense sticks? That’s funny. I know Kykyodo incense is almost non-existent in the UK. I am referring to what is called “nioi bukuro”, which are scent sachets. They are normally used to scent drawers, but can also be worn. Women used to place a sachet in the sleeve of their kimono. I used to put a sachet in my bra to enjoy the gentle scent of incense throughout the day. It has very good longevity as well. I have a sachet I bought a couple of years ago and although it doesn’t smell as potent, it still provides scent. What a lovely thing to know about! Want to find these now. Aha, thanks! I want those too. While I won’t reach for my sample again, I liked that the fragrance did smell like the name and inspiration suggest. I picture Monsieur Lutens having fun! I am very interested in reading about everyone’s favorite incense: for a long time Shaal Nuur has been my one and only…but lately I’ve discovered and loved AG’s encens flamboyant and BK’s incense oud. Expensive loves, for “solinotes”. I am trying not to cave and buy a good classic instead. Oh, and I’d love to try incense pure! The whole CdG incense series is very much worth trying, if you haven’t yet, and I there are some good ones in the Olivier Durbano line too. And then there’s Bond no. 9 Andy Warhol Silver Factory, which is a wonderful scent that sort of gets lost in the HUGE Bond line. And I’m sure we’ll get other great suggestions! Oh, I second the CdG incense series, especially Avignon! You know, I really liked it — dry & smoky. Very worth trying. I’m not a huge fan of incense fragrances (whenever I try them, I often think I’d prefer them in candle form) but I enjoyed La Fumée as well. Very likeable and wearable. Armani Privé Bois d’Encens is nice too. Still, I’m appreciative that the nice folks at SL have been going through the trouble of sending out samples of the recent export releases. You know, I think sometimes if you’re anosmic to 1 musk, it “blocks” the others, and sometimes blocks everything — I think that sometimes accounts for vastly different reports on lasting power of some fragrances. I can still smell Froide hours later, and even after a shower. But it’s light & close to the skin. Passage d’Enfer, which I also think of as a light fragrance, has much more diffusion. That kind of makes sense. You’d expect to be able to smell other things that make up the base even if the musk (or whatever other chemical one might be anosmic to) doesn’t come through, yet, somehow, the whole thing just disappears. I can’t get more than an hour or two out of Bois des Îles and often wonder if I’m just anosmic to whatever’s in the base. It’s hard to say. I don’t know how short lived the new BdI is (you’re talking about the EdT, right?) — I have the parfum & it lasts for hours. But there are fragrances, like Bvlgari Omnia, that some people just don’t seem to be able to smell at all, or can only smell for a few minutes. I wish I understood the mechanism, but obviously people aren’t anosmic to every single note. The LE EDT version is very fleeting (I-get-more-wear-out-of-La Pausa fleeting) on me. I finally got to try parfum this month and it was a little better but still all but disappeared after a couple of hours so I’m thinking it’s me and not the perfume. You are pickier than I am — I am willing to try anything Serge Lutens makes! You bet I am! I always was but since I discovered that there are some niche around my nose I’m even more picky. I was so intrigued by this on the strip, but on my skin everything interesting got drowned out by the sportified man smell–very harsh on me. Ah well. It’s not like he hasn’t made a bajillion other things I love. More than once while testing this, I had that sensation where you forget you’re wearing a fragrance and suddenly notice a smell and for a split second, wonder where that fabulous scent is coming from, you know? Except in this case, I was wondering why I was suddenly smelling “generic man smell” (that is literally how I think of it). And then I remembered. But each time, that was within the first 45 minutes. And again, up close, to me, it does smell “good”. But it’s hard not to think of it as trite when a brief whiff from a distance reminds me of the men’s counter at Macy’s. Trite I could live with! And I wish I’d had the sensation you describe. For me it was like a radio slowly getting louder and louder. Maybe I became anosmic to the other notes? Interesting! Or maybe it’s me that is missing some part of the minty gingery stuff. Or the aquatic stuff, which I think I hardly notice, but I must register it if I’m thinking “generic man smell”. I wore this into the office today since I’m looking for a summer office scent. The mineral aspect of it really comes out in dry, conditioned air. It’s refreshing and light. The dry down was soft and spicy. I re-applied at lunch just to get the chilly opening zing in my hot car. It’d definitely work for my office days. Yes, I can see it being perfect for the office, whereas even Ouarzazate might be too much. I am thinking that this will not be for me, but I will try it anyway–I appreciate most SL scents, even when they aren’t for me! Summer incense sounds nice, but I don’t ever want to smell generic! Do try it, maybe you’ll like it better than I did! I got a sample- I must re try . I didn’t like it too much . I have very nearly given up ironing entirely, that’s probably why the 1st L’Eau didn’t grow on me! Really don’t think I have my ironing board out more than once or twice a year. Exactly! My son is probably unaware that for some people, it’s a part of daily life. HAH – I can’t remember the last time I ironed anything. No more dry cleaning, either! Wonderful review, Robin, as always! I love that you don’t play coy — straight away you announce this didn’t make the RBL (Robin’s Buy List) — then go on to give us the details. And of course we read on, because, for me at least, it is imperative to know why you liked but didn’t love it, how it pleased you but failed to tease its way into your heart. My favorite incense is CdG Kyoto, which earned a spot in my perfume mini fridge. Andy Tauer’s Desert Marocain may end up joining it there. Armani Privé Bois d’Encens was on my buy list until I smelled the reformulated version. Heeley’s Esprit du Tigre is very nice, assuming you like menthol. But what on earth did they do to the Armani? I didn’t know it had been reformulated, although I guess I should have since everything else has. Armani hasn’t announced or acknowledged a change, but it was off the shelves and darned hard to find anywhere — even the Armani boutique was out of the Bois d’Encens, although the other Privés were in stock — and when it finally returned to Saks, it smelled distinctly different to me. Not bad, just no longer wonderful. Poo. “Perfume mini fridge”? What an interesting idea! Is this a method you’ve used for long? I’m interested in hearing more about this storage tactic, please. Would you care to elaborate? Hi Knit1, happy to share: We have a built-in mini fridge in the master bath, originally intended for beverages (kind of silly, since it’s a not-big house and the kitchen is close at hand). I long ago commandeered it for perfumes. I have absolutely no scientific proof that it helps keep fragrance from going bad, but my 4-year-old bottle of Calyx hasn’t turned, so that’s saying something. Some people have wine fridges; I have a perfume fridge. It works for me. I guess my favorite incense is Avignon. I find it wearable year-round, although I apply it judiciously in warm weather. To me, it is dry and airy enough not to suffocate in the heat as many “heavy” scents do. 4) My tastes and/or skin chemistry have changed drastically within the last year or so. I guess I could try to swap it away some day, although I would not want to fob it off on someone if it is actually spoiled. I hope it is one of 2, 3, or 4. So, does anyone want a new, full bottle of Ouarzazate that has only been sprayed twice? If you are interested in a swap, you can contact me at roses_50 atsign yahoo period com (just replace “atsign” and “period” with the appropriate punctuation). Oh, that’s too bad! I do sometimes find spraying very different than dabbing, but other than decanting from your own bottle to test, it’s hard to say if that is the problem.